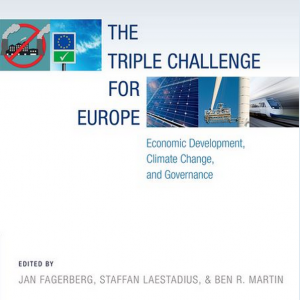 The Triple Challenge for Europe, book by Jan Fagerberg, Staffan Laestadius and Ben R. Martin. The main message is summarised here. Europe is confronted by an intimidating triple challenge – economic stagnation, climate change, and a governance crisis. This book, published by Oxford University Press in October 2015, demonstrates how the three challenges are closely inter-related, and discusses how they can be dealt with more effectively in order to arrive at a more economically secure, environmentally sustainable and well governed Europe. In particular, a return to economic growth cannot come at the expense of greater risk of irreversible climate change. Instead, what is required is a fundamental transformation of the economy to a new green trajectory based on rapidly diminishing emission of greenhouse gases. This entails much greater emphasis on innovation in all its forms (not just technological). What is needed is not a new Manhattan program but policies that provide a clear and explicit sense of direction to this collective innovation journey, that support diffusion, learning and improvement of promising technologies, and that generate opportunities for entrepreneurial action. Following this path would mean turning Europe into a veritable laboratory for sustainable growth, environmentally as well as socially. For a workingpaper summarizing the main message of the book click HERE, a blog post is here. A powerpoint-presentation is also available. Watch an interview with Jan Fagerberg about the book following a presentation at the Manchester Institute of Innovation Research, University of Manchester, UK, November 9, 2015. 1: Jan Fagerberg, Staffan Laestadius and Ben R. Martin: Introduction: The Triple Challenge for Europe. 2: Jan Fagerberg and Bart Verspagen: One Europe or Several? Causes and Consequences of the European Stagnation. Go to the workingpaper version. 3: Michael A. Landesmann: The new North-South Divide in Europe – Can the European Convergence Model be Resuscitated? 5: Hubert Schmitz and Rasmus Lema: The Global Green Economy: Competition or Cooperation between Europe and China? 8: Iain Begg: EU Policy and Governance: Part of the Problem or Part of the Solution? 9: Mariana Mazzucato and Carlota Perez: Innovation as Growth Policy: the Challenge for Europe. Go to the workingpaper version.